The good news about potato fries is that they are made using potatoes. Most of us love potatoes because they are a satiating starch with lots of vitamin C, B6 and a fiber rich food. I call potatoes my “happy food” because they are a good source of vitamin B6 (and lots of other vitamins too). The sad news is that most people enjoy potatoes in their worst possible nutrition scenario: fried! Regularly eating minimally processed potatoes or sweet potatoes without oil/butter/margarine or cheese does the body and mind good. We can enjoy minimally processed potatoes with a small amount of salt and/or sugar (yes, that means you can add a bit of ketsup, salt or even maple syrup). These healthy starches should be included in our diets and here is why. 1) Plant-Centered – Center your plate and your diet predominantly with plant foods (fruits, vegetables, starchy vegetables, roots/tubers, intact whole grains, and legumes such as beans, peas and lentils). 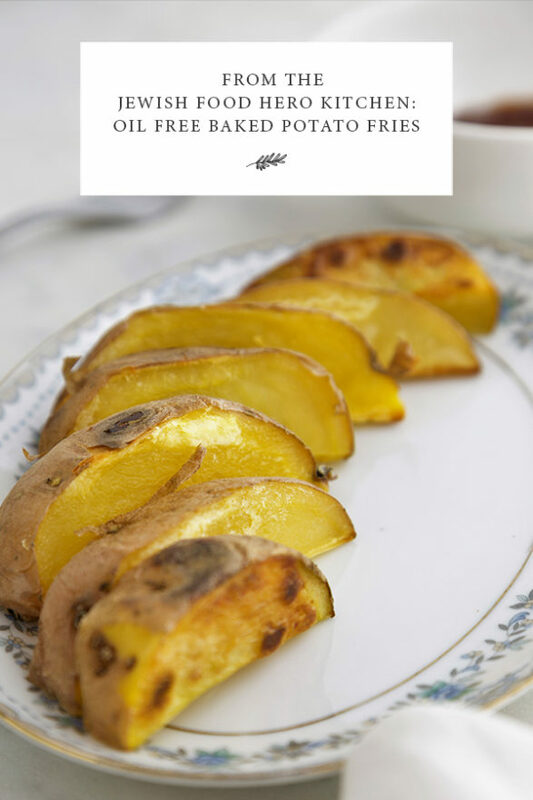 Oil-free baked potato fries meet all the above requirements, are delicious and satiating. Children and adults love them. We enjoy baked potato fries every week in our house. Here is our simple recipe, that you can spice up if desired. Pour boiling water over the potatoes so they are completely submerged and allow to sit for 10-15 min. Your turn: What is your favorite sauce to eat with baked potato fries?